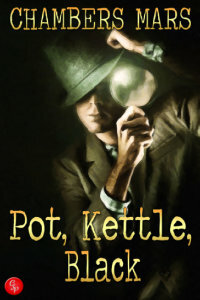 Pot, Kettle, Black is the first Zac Tremble Investigates novella. It accompanies the Zac Tremble Investigates case files. This story centres on the time immediately after Zac took over the agency, following his father's death. That was three years before the period described in Chrysalis; the first case file that I published. Unconstrained by the usual format of the case file, I can really 'go to town' with Zac this time. And you'll get to meet the main characters as they were at the end of Zac’s father’s tenure of the agency, which hadn't really changed since its doors were first opened by Zac's grandfather in 1946. The story is based on three cases that all open up at the start; they all involve Zac in getting to the truth about the private lives of three people. If there is a general theme it's 'honesty' and perhaps 'perspective'. Zac is waking up to the fact that his father is dead and he has a PI agency; an agency that is more than just a business. He's beginning to see things differently himself. Elizabeth is, as she has always been, at the centre of Zac's Universe; the only real link that he has to his mother and father, both now dead. Like any fledgling, Zac's wings need exercise and he needs the confidence to take off. There's the odd bump into a tree along the way; it's compensation for the moments when he soars into the stratosphere! As Pot, Kettle, Black pre-dates the first 'Zac Tremble Investigates' series, it's a good place to start if you want an introduction to Zac. Zac is young, gay and lusty. This story has an adult theme, aside from the cases being investigated. The descriptions of the sexual relationships are not especially graphic, but they are, nevertheless, a feature.